Get staff engaged in evidence-based practice and quality-improvement projects. Using a participatory and shared governance approach, nurses conducted evidence reviews to identify interventions to improve patient satisfaction with sleep and noise. Nurses used Lean Quality Improvement methods and developed innovative approaches to tackle patients’ satisfaction with sleep and noise. At the University of North Carolina Medical Center (UNCMC), a Magnet®-recognized 803-bed level I trauma center, we receive impressive Hospital Consumer Assessment of Health- care Providers and Systems (HCAHPS) scores. However, patients’ responses to the question “During your hospital stay, how often was the area around your room quiet at night?” often fell short. Although specific sources of noise weren’t identified, two facts are certain: Noise levels in acute-care settings have increased significantly over the years, and sleep disturbance among hospitalized patients can impair healing and contribute to functional and psychological impairments. Based on these data, national attention on the role of sleep in health and well-being, and the fact that sleep quality is amenable to nursing intervention, the UNCMC division of nursing identified sleep promotion and noise reduction as annual goals. To address the noise problem, two inpatient units agreed to participate in a quality-improvement (QI) project based on their less-than-optimal scores for quietness of hospital environment. Project team members from the units included the nursing director, 10 clinical nursing staff, the unit environmental services (EVS) supervisor, and one patient. Support and resource personnel included a nurse-scientist, two QI leaders, and a health sciences librarian. The team used interrelated strategies to tackle each aspect of the project—sleep promotion and noise reduction. Using a participatory and shared governance approach, the team began work on sleep promotion with a facilitated brainstorming session to generate ideas. Possible interventions were suggested and categorized into broad topic areas (for example, massage, music, and earplugs were categorized as nursing interventions). With the assistance of the health sciences librarian and nurse-scientist, groups of two or three members identified search terms, reviewed the literature on each topic area, and created evidence tables to display their findings, which they then synthesized and critically appraised for feasibility, cost, and nursing burden. The groups presented their findings and offered recommendations to the committee. The reviews provided new knowledge about the validity of various sleep-promoting interventions and informed decisions about which interventions would be trialed on the two units. 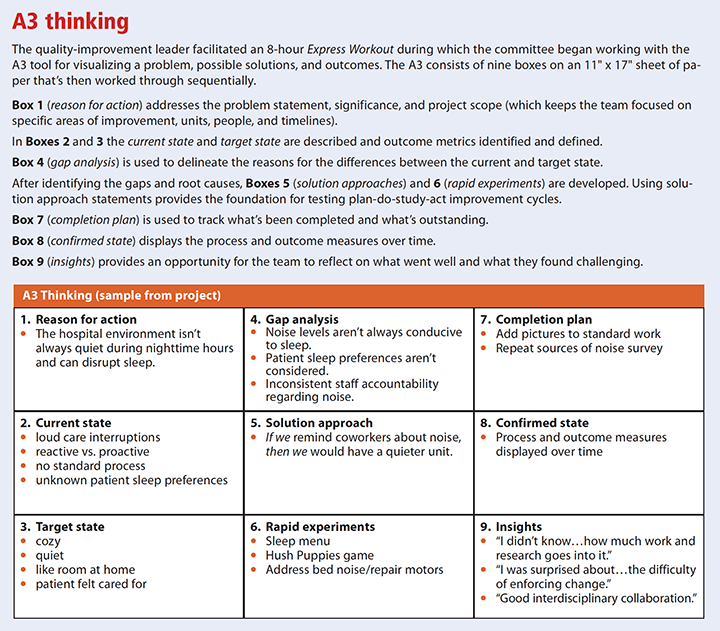 Based on the interventions identified in the literature evidence tables, the team chose four—offering a sleep menu, offering warm water (shower or bath) at bedtime, replacing noisy equipment, and lowering staff voices—for PDSA cycles of improvement over several weeks. The nurses developed a sleep menu to standardize and individualize patient sleep hygiene. (See Sleep menu.) They discuss the sleep menu with patients and ask about their previous night’s sleep. These exchanges serve to acknowledge sleep hygiene as an important part of patient care and offer non-pharmacologic alternatives to achieve restorative rest. The results of the conversations with patients are shared during nurse-to-nurse handoffs and with other care providers as needed. A warm bath or shower before bedtime was impractical to implement on a broad scale in a hospital setting. However, EVS team members suggested a creative approach: Offer warm washcloths to the patients in the evening, which became part of the next experiment and PDSA cycle. To address noise level, patients were asked to rate 22 sources of unit noise as bothersome or not bothersome. Frequency counts on each of the items identified three prevalent bothersome noises: noise from patient beds, squeaky equipment, and talking/voices. The team addressed patient bed noise first. Although we suspected that noisiness originated from the pressure-relief mechanism, critical evaluation using the PDSA cycle indicated that bed motor volumes varied widely. In cooperation with engineering services, these discrepancies were remedied either by repair or replacement. To address squeaky equipment, EVS replaced noisy wheels on carts and chairs. Talking/voices was a more sensitive issue and required behavioral changes. The team knew diplomacy and consideration were needed to successfully address this problem and engage unit staff. To reduce talking and voices in a positive nonpunitive way, the clinical nurses developed the Hush Puppies game. Everyone (physicians, nurses, unit clerks, and others) is encouraged to participate, and the rules are simple: Each staff member receives a small, decorative hush puppy clip at the start of the shift. If a colleague is being noisy, staff members are empowered to politely remind the colleague about lowering his or her voice and to take his or her hush puppy clip. The staff member with the most clips at the end of the shift is declared the winner and awarded a small prize. The game effectively increased noise awareness, engaged staff in the changes, and fostered peer-to-peer feedback. The project team established process measures to assess adherence to the interventions. Outcome measures included monthly HCAHPS Top Box scores on the quietness of hospital environment and the sources of noise survey scores. The team set a goal of 5% improvement in HCAHPS and a 20% decrease in bothersome sources of noise. The team met monthly to complete the final components of the A3 tool (completion plan, confirmed state, and insights). To assess project progress and the results of the experiments, process and outcome measures were displayed on a Managing for Daily Improvement Board on each unit. Committee members discussed barriers to implementation and solicited ideas from other staff about how to make daily, weekly, and monthly improvements. Several PDSA cycles continued for each experiment based on staff feedback. The team’s completion plan included monitoring and maintaining individual action items, such as monthly meetings to report on current status and to compare current project metrics against preintervention HCAHPS scores. Clinical nurses were contributing members of the project committee from start to finish. Their level of engagement was achieved by scheduling all anticipated meetings in advance and on a day and time they suggested. Soliciting staff input acknowledged their unique scheduling needs and fostered consistent meeting attendance. Having a designated facilitator, engaging support personnel (librarian, QI leader, nurse-scientist), limiting participation to two units, and including the unit managers and clinical staff maximized the team’s expertise, distributed the workload, and lessened the burden on any one group or individual. HCAHPS Top Box scores improved on both units; one unit exceeded the 5% improvement goal at 90 days. Both units achieved a reduction in top sources of bothersome noise goals when resurveyed at 90 days, and they continue to work on improvement and sustainment. The results of the HCAHPS scores, sources of noise survey, and the sleep menu responses suggest that perceived quality of sleep, perception of noise, and overall satisfaction with care can be improved in our setting using simple solutions. However, clinical nurses play an essential role in encouraging a culture of quiet by modeling quiet behaviors. This project demonstrates that, in the presence of appropriate support and guidance, clinical nurses can actively contribute to knowledge development and translate evidence into clinical practice. The authors work at the University of North Carolina Medical Center in Chapel Hill. Christine Hedges is the director of nursing quality and research. Erica Wolak is a senior clinical quality management engineer in nursing quality and research. Cheryl A. Smith-Miller is a nurse-scientist in nursing quality and research. Turkeisha Brown is nurse manager, adult medicine acute care unit. Barnes CM, Drake CL. Prioritizing sleep health: Public health policy recommendations. Perspect Psychol Sci. 2015;10(6):733-7. 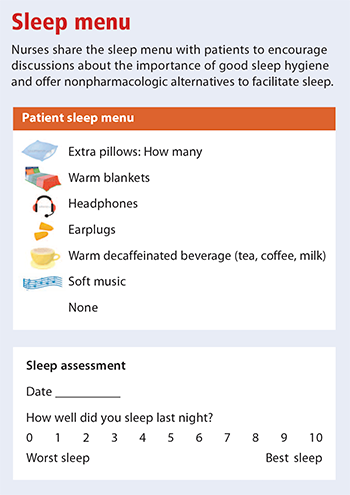 Clark A, Mills M. Can a sleep menu enhance the quality of sleep for the hospitalized patient? Medsurg Nurs. 2017;26(4):253-7. Halm M. Making time for quiet. Am J Crit Care. 2016;25(6):552-5. Hedges C, Hunt C, Ball P. Quiet time improves patient experience. J Nurs Care Qual [in press]. Murphy G, Bernardo A, Dalton J. Quiet at night: Implementing a Nightingale principle. Am J Nurs. 2013;113(12):43-51. Shaw R. Using music to promote sleep for hospitalized adults. Am J Crit Care. 2016;25(2):181-4. Tainter CR, Levine AR, Quraishi SA, et al. Noise levels in surgical ICUs are consistently above recommended standards. Crit Care Med. 2016;44(1):147-52. Wilson C, Whiteman K, Stephens K, Swanson-Biearman B, LaBarba J. Improving the patient’s experience with a multimodal quiet-at-night initiative. J Nurs Care Qual. 2017;32(2):134-40.